Leslie Ernest Woodley (No.13 in the list of male British team members)was born in Aston, Birmingham, on 31st July 1935. Shortly after the war he and his family moved into a house at the back of Walford Road, Sparkhill, where of course the old Embassy Sportsdrome was situated. The Embassy boasted the largest roller rink in Europe at that time and it wasn't long before young Woodley started going along and skating on a pair of old steel wheeled dance skates given to him by an aunt. 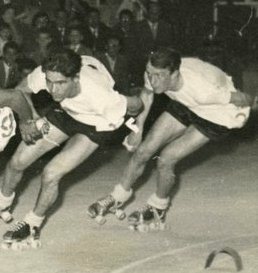 As a youngster he soon acquired his own skates and started to race his friends in the speed sessions between the general public sessions. Although speed was his main focus of attention, Woodley was also an accomplished dance skater, who partnered the likes of British Champion Maureen Jackson at times in between his quest for glory on a track. It wasn't long, however, before it became apparent that Woodley was someone to be reckoned with. Aged just 16 and skating for the Birmingham club, in 1952 he entered the British Open Mile Handicap Championship at Granby Halls, Leicester, and became the first ever winner of the Jesson Cup (still raced for today) starting of 55 yards. It was virtually unheard of for a 16 year old to win a major event such as this. Just a year later and Woodley was called up to the British team to compete in the 1953 World Championships in Venice, Italy. Just turned 18, Woodley finished third in the first event, the 5000 metres as a result of a downpour where other competitors found it difficult to handle the slippery surface. His results in the other events were nothing to write home about and Woodley would later say that the tactics of the British team management left a lot to be desired - which was to go to the front and make the racing as hard as you could for the opposition and effectively "blow them away". Being a youngster he did as he was told, and of course, in a world class field this tactic simply did not work. In 1954 he missed out on a place in the team for the World Championships in Bari, Italy as he was stationed in Honiton, Devon, in the army and found it difficult to attend the team trials. In those days the team was only selected on trials and not on race performances. There would be no World Championships in 1955 and Les decided to marry his long time sweetheart, Barbara. Barbara was herself an accomplished athlete having been on the British Olympic swimming squad for the 1952 games in Helsinki. 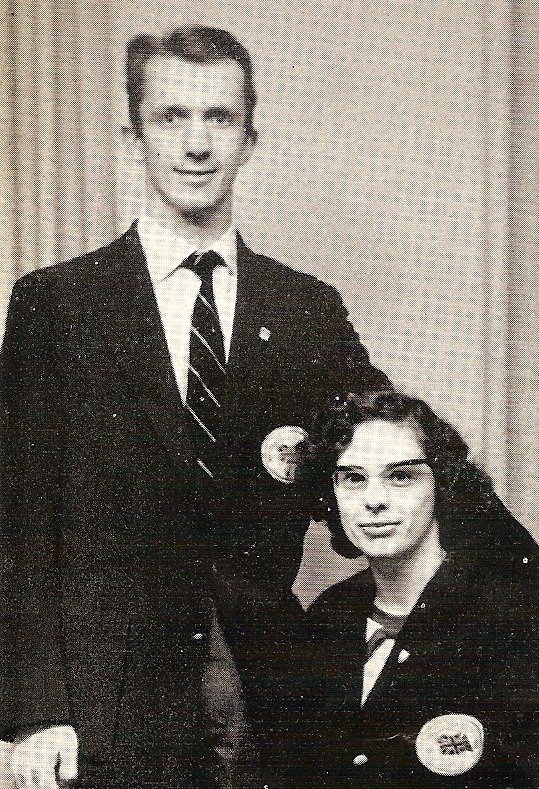 Barbara was also a talented speed skater with the Birmingham club and together they made the ideal skating couple. Fellow club mate, Graham Stead, was Les's best man and a year later in 1956, both Woodley and Stead would be in the British team for the World Championships in Barcelona, Spain. Under the team management of Bert Lamb, Woodley would come away with a silver and bronze medal in the 5000 metres and 10000 metres respectively. Woodley later commented on how the Italians were masters at grabbing, blocking and generally all round "dirty" tactics that no other nations really employed at that time, something that wouldn't really change for almost another 40 years! In 1957 Britain did not send a team to the World Championships in Palermo, Italy, citing unsuitable training venues in London as the excuse. Despite this, it would still be an important year for Woodley who on 9th February secured his first British title with a win in the Half Mile Championship at Herne Bay. A year later and he would retain his Half Mile title and add the One Mile to his collection. These results, however, still did not secure him a place in the British team for the forthcoming World Championships in Finale Ligure, Italy. The trials were on a rough road and Woodley, for whatever reason, seemed to destroy his wooden wheels on such surfaces. Once again, his inclusion was overlooked. There was some consolation, though, with the inclusion of his wife, Barbara, into the team for the very first time. 1959 was a difficult year for Woodley. He had switched clubs from Birmingham to Midland (through no other reason other than he fancied a change) and joined his wife, Barbara, who had joined a few months earlier. Again, no World Championships were held so the priority was the British Championships. In December 1958 Woodley had already lost his Half Mile crown to Leo Eason at the Granby Halls in Leicester. Although he won the Northern and Midland Counties Championship in January 1959 he was still out to win the Five Mile Championship and retain the One Mile. First up in February was the Five Mile on his home track, the Embassy, but this was also the home track of the new Half Mile Champion, Leo Eason and it was Eason who would win just ahead of Woodley. The final Championship of the season was the One Mile and Woodley went out to try and retain it on the Herne Bay rink. In the final was Woodley, Danny Kelly, Leo Eason and local lad, Jim Lipyeat. Woodley jumped the start and was immediately put back 5 yards. With the start at Herne Bay being against the back wall this meant Woodley had to start from half way round the bend. Soon after the race had started for a second time Woodley had passed Eason and Kelly and was chasing down Lipyeat who had pulled out a gap. Off the final bend a tired Lipyeat went wide and Woodley sprinted for the line, just getting his man on the line, or so he thought. When the result was announced that Lipyeat was the winner, Woodley immediately thought that he had been disqualified, however, the result then came out that he was second. To this day Woodley maintains that he won the race by a clear yard and was "robbed" of his victory by the then finishing line judge and former team mate of Lipyeat, Reg Smyth. Early in 1960 Woodley had put the previous year behind him and went on to win both the One Mile and Five Mile Championships within a few weeks of each other. By September the team for the World Championships had been announced and both he and his wife were both selected to represent Great Britain for the first time together. These World Championships would prove to be controversial in so far as the British team were withdrawn in their entirety as a result of "deficiencies in organisation" as the Team Manager's report later stated. This drastic action was taken as a direct result of the declassification to last place of Leo Eason in the 5000 metres and the obvious mix up in laps in the 1000 metres knock-out skated by Barbara. In essence, Barbara had been drawn against a German skater and had comfortably beaten her to the finish line in her round, only for the bell to be rung for another lap. The result was that the German skater beat Barbara to the line after they both skated an additional lap. The error was obvious but the protestations fell on deaf ears. It was suggested that there be a re-run, but, and quite correctly, Barbara refused on the grounds that firstly she had crossed the line first after the correct number of laps and secondly, she would be at a distinct disadvantage in further rounds against "fresher" competitors. The result was a stale mate and the withdrawal of the entire British team. Woodley maintains that this was entirely the wrong decision and that the British team had, in fact, "cut off their noses to spite their face". A sentiment certainly echoed by fellow team mates Pat and Leo Eason. To make matters worse, the British also boycotted the next two World Championships, both in 1961 (Voltrega, Spain, on the track and Gujan Mestras, France, on the road). As Woodley himself acknowledged, these were simply missed opportunities that British skaters would never get back and left the country being viewed as "pompous" by its European neighbours, who were also rubbing their hands together at the exclusion of British skaters who at that time were amongst the world's elite. Also in 1960 Woodley decided that he wanted to go out and set some new World Records. He felt that Brixton was the ideal place to do so, but the rink itself was generally skated as a giant circle. For records to be established the rules stated that a track must have two bends and two straights. Woodley asked the management of the Brixton rink if he could mark out a "special" track in which to set these records. The management agreed and Woodley employed the services of a local architect to draw up the plans for a track that satisfied the rules. These plans were drawn and the rink was duly prepared. On 24th September both Les and Barbara went out and set no fewer than 27 new World Records between them. For Les he now held every World Record from 1/4 Mile to 20 Miles, from 500 metres to 30000 metres and in time versus distance records both the half hour and hour record. Incidentally, Les's record for 30000 metres on a track still stands to this day as a British Record! Woodley was an astute character and learned very quickly what was right for him. He wasn't averse to getting his opinions and criticisms across by standing on a chair to address his audience, but the older generation, the likes of George Lord, Bert Lamb and Henry Crystall, were not used to be being challenged and saw Woodley as a troublemaker. Nothing was further from the truth. Woodley simply wanted to put right any wrongs and would do so with simple facts. He was almost obsessive about times, his desire to set new World Records being testament to this. When he wasn't racing he would be seen trackside with a stopwatch recording every lap of each distance. The best example of this came early in 1962 when at a race meeting the result and time of a heat was announced and Woodley instantly recognised that they had done a lap short and he had the data to prove it. He entered the "inner sanctum" of the track to demonstrate to George Lord the error. The result being that not only was Woodley's data ignored but he got banned for six months for stepping into the middle to confront the officials. It was a full NSA hearing where Danny Kelly acted as his witness, but the decision stood. This meant that Woodley could not join his team mates for the Championship relay that year at Brixton and had to miss one of the individual Championships. Woodley had been a member of the winning relay team for six consecutive years prior to his ban (he would win it a further two years afterwards too - right up until he retired, in fact). Despite Woodley's exclusion his Midland team mates put up a valiant effort only to be disqualified in the semi final. The eventual winners were Brixton on their home track. "Once again we have had faulty lap-scoring. Les Woodley goes on the floor to protest and gets a month's suspension! (Shades of the Gestapo). Why don't the NSA just stop racing? It would save them a lot of trouble, and it would save me the bother of feeling compelled to write about their obvious shortcomings - there are more pleasant things to do". Later in 1962, after serving his ban, both Les and Barbara again found themselves in the British team, this time for the World Championships in Venice-Lido, Italy. The track was newly built banked track and Woodley loved it. He had only skated one banked track before and that was a narrow track in Nuremburg a few years earlier, but this was different. It was wide and it was fast. In the 10000 metres Woodley managed third place, but this does not tell the full story. For whatever reason, Woodley thought there was still a lap to go and as they came to the line he attacked for the final lap. He had been in a comfortable third place and went around the outside only to find himself skating the back straight alone. Woodley genuinely feels that if ever he was to have been World Champion, that race was it. Unfortunately, the mix up possibly prevented him realising his dream and he had to accept that the 10000 metres was the one that got away. Despite winning national titles back home in both 1963 and 1964, the 1962 World Championships would be Woodley's final outing in a British shirt. In February 1964 he won his 11th British title, the One Mile, sharing the record with Jimmy Reed. In winning the Mile he had now done so an amazing and record breaking five times in succession. Woodley maintains it should have been SEVEN had it not been for the 1959 incident. Either way, it was a remarkable achievement and a record held for 33 years until Sutton Atkins made it six in a row in 1997. For the record, nobody has won it seven times in succession. On 25th April 1964 Woodley also won the Half Mile yet again, taking his tally to 12 British titles and putting himself once more in the record books. This particular record stood until 1979 when Mick McGeough (dead heating with John Downing) won his 13th British title, the 10000 metres at Southampton. Woodley only did one more race after his Half Mile victory, the One Mile Aspley-Struggles Trophy at the Embassy. He would finish second to best friend and later business partner, Ray Roberts. Roberts commented that he had "finally got him", and on 2nd May 1964 Les Woodley retired from skating and walked into a whole new life - as a golfer! Although this site is dedicated to Woodley's exploits as a speed skater his golfing achievements should also get a mention. On retiring from skating he famously had his medals melted down and made into golf clubs - two putters to be precise. On reflection Woodley now regrets doing this, but back then he wanted a link between his love for speed skating and his passion for golf. As testament to his character Woodley went on to be a Champion golfer and managed to get down to a handicap of just ONE! As with the skating it was a sport that both he and wife Barbara enjoyed together. Woodley bought himself a property in Spain and spent much of the year there, joining the golf club at Valderrama. 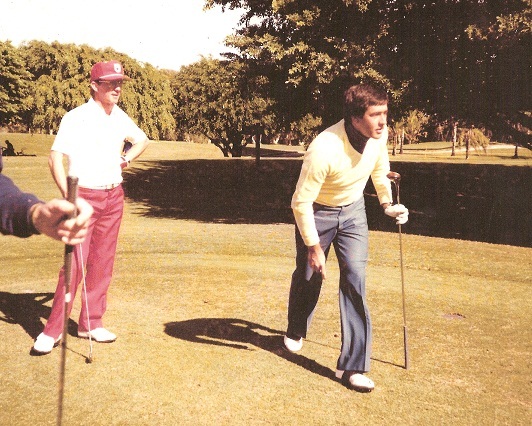 In doing so he found himself rubbing shoulders with the likes of Seve Ballesteros, Greg Norman and Sandy Lyle. In fact Lyle would become such a good friend the he would often stay with Woodley during his trips to Spain. Sadly, Barbara passed away in 2006 and since then Les has spent less time in Spain and finds himself more often back home in Birmingham. A chance meeting with John C. Fry on an internet forum led to a meeting between the pair and Woodley giving up his time to conduct a British Skating Legends interview. Afterwards Fry took Woodley to watch a training session at the Birmingham Wheels track. It was the first time Woodley had been anywhere near a skating track in almost 50 years. His eyes lit up and in an instant his mind was back to when he dominated the British rinks. Since then Woodley has been a regular attendee at race meetings whenever they are held at the Birmingham Wheels venue, and in fact he was asked to present the trophies for the 2013 British Championships in August of that year. As he presented the Benetfink Cup to Sutton Atkins for his victory in the 1000 metres (previously awarded for the One Mile Championship), Woodley felt he had been "reunited" with "his" cup that he last held some 49 years ago. It was a touching moment and fitting to see two great champions together. Woodley has also donated two trophies to the Birmingham Wheels club - The Les Woodley Trophy and The Barbara Woodley Trophy. The races are held over one mile (collectively known as The Woodley Mile Events) in keeping with the distance that both he and Barbara set world records. Incidentally, these times are still the fastest recorded times for a mile set by both a male and female skater in Great Britain, testament to just how quick these times are, even with all the technical improvements and changes in equipment seen today. As a skater he never achieved his dream of World Champion, but you would be hard pushed to find a more deserving person than Les Woodley. He is undoubtedly one of the few people who the word "legend" was invented for.